Languishing in self-imposed exile, Charlie has become a glorified house sitter. His latest gig comes replete with an illegally squatting B-movie actress who rants about hitmen who specialize in making deaths look like accidents. Unfortunately, it's the real deal. Hardie finds himself squared off against a small army of the most lethal men in the world: The Accident People. It's nothing personal—the girl just happens to be the next name on their list. For Charlie, though, it’s intensely personal. He’s not about to let more innocent people die. Not on his watch. Fun and Games starts at breakneck speed on Decker Canyon Road, L.A., and never lets up to the very last page. Lane Madden is tearing up the road in a rented Lexus. Suddenly aware of someone following her, she guns the gas pedal, hoping to lose the pursuer. She can’t. Every turn she takes, he’s behind her. Finally, the inevitable crash happens, and Lane is knocked almost out by the impact. When she eventually comes to, her pursuer is standing over her, his hand holding a needle filled with lethal liquid, ready to insert it into her veins. She suspected this day would eventually come, but now that it has, it fills her with horror. Who is the mysterious pursuer/assassin, and why does he want Lane dead at any cost? 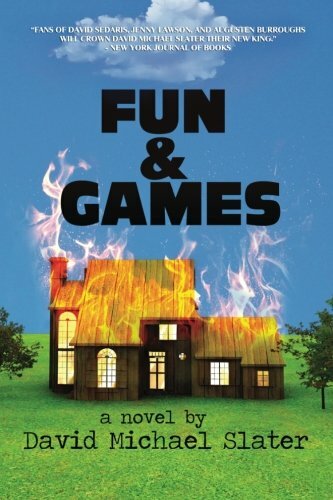 Fun and Games is the first in a proposed trilogy of books featuring ex-cop Charlie Hardie. Charlie’s life was ruined in a bloody tragedy three years earlier, and ever since then he has carried the weight of guilt on his broad if somewhat tiring shoulders and in his tormented soul. He’s drifted through life in an alcoholic haze, making ends meet by house sitting for the rich and famous, and occasional infamous. He wants nothing more than to hammer his already hammered body into a drunken zombie-like state while watching old movies and forgetting that life—especially his life—ever existed in the first place. Suddenly, things are looking up. Charlie believes he has landed a dream assignment when he starts house sitting for a famous movie composer living in the Hollywood Hills. The house is everything only Hollywood could dream up, with every conceivable mod con and invention. A house to die for. Unfortunately for Charlie, that tag could become literally as well as figuratively. On his first day in the new house, Charlie is assaulted by a crazed woman who is squatting in the composer’s bathroom. The woman smacks him with a microphone stand and then starts babbling about a mysterious ‘them’ who are trying to kill her and make it look like an accident. At first, Charlie thinks she’s just a washed-up drug addict illegally residing in the households of Hollywood Hills. Her incoherent babbling about a mysterious group known as The Guild or their ground dogs, The Accident People, does little a to assure Charlie of the woman’s brain cells being undamaged by numerous drugs intakes. The Accident People, according to the deranged woman, are cold-blooded assassins who do just that: create perfect looking ‘accidents’ with all the flair of Hollywood. Of course, the difference being is that the blood is real, and the people who have had the unfortunate “accident,” never get the chance to boast how they survived it—simply because none ever do. Charlie has a private laugh at this outrageous declaration, but his attitude suddenly changes when the Accident People arrive at the house, looking for him to have an accident also. Fortunately, Charlie is not yet ready to allow his life to look like someone else’s accident, and his formidable talents as a survivor suddenly come to the fore. Let the fun and games begin. Charlie Hardie is a brilliant creation, and Fun and Games is the perfect book to introduce him to an unsuspecting reading public. We can empathize with him on almost every level, be it his guilt from past actions, his lack of luck other than bad, or his simple but well-fostered decency in seeing the right thing done, even if it’s the wrong time and wrong place and usually with the wrong people. Fun and Games is one hell of a roller coaster read. Mr. Swierczynski writes like Elmore Leonard on adrenaline and speed. You rarely get time to catch your breath, and when you do, you realize you are breathing rather slowly, as if the Accident People are outside your door, listening. Publisher Mulholland Books is to be commended for their expanding stable of excellent crime writers, and for adding Mr. Swierczynski to that list. This is the summer read we’ve all been dying to get our hands on. Perfect for beaches, planes, trains & automobiles. Especially recommended if you’re a house sitter. . . .